The Connect Global Team often comes across a story and situation that just makes sense to offer help. Our friend and National Director Jorge Amador was introduced to Maria through our friends Pastor Allan and Pastor Miguel of CCI Church. CCI Church is very active in opening up their church to the community and offer aide to so many in need near La Ceiba, Honduras. Update March 13: Jorge has recieved and delivered the doors and windows for the house and will be installing soon. Update April 9: Jorge Has delivered and began installing trusses for roof. Update May 20th: Jorge and Team have Connected Electricity, Plumbing and Interior Walls. Maria is a strong and determined single-mother in La Ceiba who will soon have a strong new home to raise her children in. Connect Global was introduced to Maria and her need for a concrete home was described to us by CCI Church as well as our own National Director, Jorge Amador. Maria is a single mom, whose husband abandoned her and their children. She was also recently hospitalized and left with no money to make much-needed improvements to the dwelling she was left with. Connect Global quickly decided to get involved in the project to help build her a home. Many volunteers and the pastors from CCI church as well as the local church in El Porvenir were already planning to help Maria in this endeavor so we joined too. What Connected Community, our local initiative to work on community improvement projects, looks like. Through the process of getting permits and approvals for our Maternity Home in La Ceiba, Jorge was able to mention this home project for Maria to our Lawyer, Alejandra. Alejandra was very excited about the project and she wanted to see the progress of the home and to meet Maria in person. Unlike many women in Honduras, Alejandra has been able to make progress for her family and develop herself professionally in order to become a well respected and successful lawyer in La Ceiba. She wants the same for Maria. When Alejandra saw the state of the home, and met Maria, she immediatly decided to help as well and called her friend, the Mayor of El Porvenier, the town in which Maria lives, and they have generously offered to provide the roof to complete the project when it comes time to finish the house. It is so great to see the community come together and all collectively say YES to helping someone in need. No one person involved could have completed this project alone, but together we are going to be able to give Maria a home she can raise her family in with out fear of breakins, cave ins, or disease from the elements. Maria now will have the opportunity to focus on developing other areas of her life and on the well being of her children. Connect Global believes in creating opportunities for people to be able to develop into the best version of what God has planned for them. We have created opportunities by sponsoring students at a Christian school, teaching others how to build fish farms, and this time it meant helping Maria get a home. Everyone who has been involved though finances or volunteering have made a life changing impact in the life of Maria and her children. We are happy to co-labor with generous leaders and pastors such as Allan and Miguel. We are happy to work with integrous people such as our Lawyer, Alejandra. We are thankful for our partner and friend Jorge Amador for being empowered to go and make a difference in the lives of so many like Maria. We are also grateful for You and the support you generously give to make stories like Maria's turn out so positive! We will update this post as soon as we get the home completed and share with you other opportunities like this we have been working on. Do you have a story like this one? Maybe you have been able to serve someone in need that changed their life. Perhaps, you were the life changed by someone else's generosity? Share your experiences by commenting below or by emailing us at info@goservechange.com. The Connect Global Team loves being able to partner with the local church, elected officials, and others to make community wide improvements. This is Maria's home before our teams started working on the new one. The team of volunteers including our own National Director Jorge Amador who have been Working on Maria's Home. 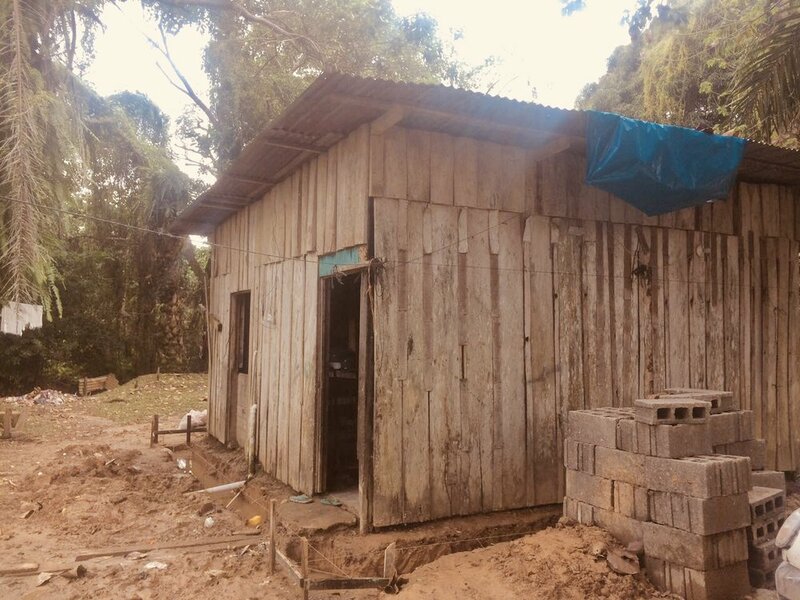 Help Connect Global complete more projects like this new home for Maria. There are many community driven opportunities to make a difference. Together we can change lives. Thank You for your support of Connect Global's Partners & Projects. The Connect Global Team has been investing in Aquaponics since our inception. Our First Official Trip as 'Connect Global' to Cusuna, we built 5 aquaponic systems. We have learned a lot since then, and our friend and partner Jorge Amador has built many more and taught several people his skills as well. We plan to build and facilitate an Aquaponic Training Center in Honduras in 2019. There are many ways that Connect Global has chosen to help raise up communities in Honduras. One way we have done this is by partnering with local church leaders who have a heart and passion for prison ministry. We have visited about 9 prisons over the past few years in various cities around the country. Over 660 Million people around the world still drink dirty water. People without access to clean drinking water become ill, miss out on school, make less money, and can even die from water borne disease.